Music Together® understands the importance of music in early childhood—from birth! Our idea that young children learn best from the powerful role models of parents/caregivers who are actively making music. Together they founded a school in Princeton with the specific purpose of putting the latest research in the field to a test. Since the time of its founding, Music Together® headquarters has continued to utilize the latest research in developing its programs. This is just one of the many things that makes Music Together® stand out from other early childhood music education programs. Music Together® is a pioneer in the field of early childhood music with truly innovative, high-quality music education and outreach programs that redefine what musical means. Music Together® began in 1987 as an educational program of the Center for Music and Young Children located in Princeton, NJ. It was founded by composer and early-childhood educator, Ken Guilmartin and professor of early childhood education, Dr. Lili Levinowitz. Together they founded a school in Princeton with the specific purpose of putting the latest research in the field to a test. 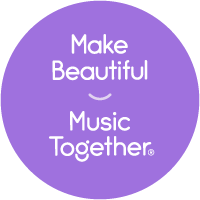 Since the time of its founding, Music Together® headquarters has continued to utilize the latest research in developing its programs. This is just one of the many things that makes Music Together stand out from other early childhood music education programs. Many people mistakenly believe that only a talented few are musical and the rest of us are doomed to sing out of tune and dance with two left feet. But the truth is, we are all born musical. In a supportive environment, children learn to dance and sing as naturally as they learn to walk and talk . This knowledge helped us develop a four-point philosophy that guides the Music Together™ program to this day. The participation and modeling of parents and caregivers—regardless of their musical ability—are essential to a child’s musical growth.